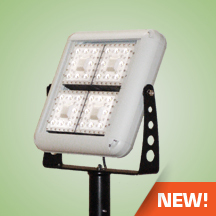 The high lumen output luminaire is designed to be a replacement for HID flood lights. It is optimal for lighting applications where long life, low maintenance, and consistent color rendering is required. Areas with limited accessibility due to fixture location or where heavy pedestrian or vehicle traffic makes maintenance difficult are ideal applications. The high wattage/lumen output allows the fixture to be used for parking, security, quick service, wall wash or general lighting applications. The heavy duty housing is constructed of extruded aluminum. The optical assemblies are sealed in place using a silicone gasket for weather tight protection. Modular LED system for ease of maintenance. ETL listed for wet locations (IP64). Available in up to a 72,000 lumen LED system in 5000K-70 CRI Cool White (+/- 500K) or 4100K-70 CRI Neutral White color temperatures propagated with Philips Lumileds Luxeon MX LED’s. Consult factory for high CRI (90+) model availability. Available with 100-300V 50/60 Hz Class II power supply. LED’s rated for over 50,000 hours at 25°C ambient temperature. 347V~480V input option available. 0-10V dimming. Built-in surge protection up to 10 kV. Built-in Active PFC Function >95%/Full load. LED Power Supply conforms to UL8750 standards and is IP65 rated for wet locations. Standard mounting option is an included adjustable yoke mount. A tenon mount adaptor is available for mounting on a 2-3/8” OD tenon (see Accessories). Additional mounting options may be available for custom applications.